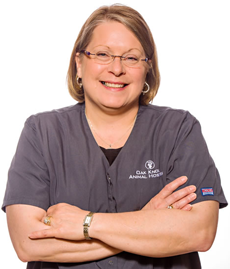 Dr. Smith is a graduate of the University Of Minnesota College Of Veterinary Medicine. He earned a Bachelor of Science degree in Zoology from Iowa State University. Away from the clinic, he balances a busy household of kids and pets with time for his hobbies: fishing, barbecuing and reading. 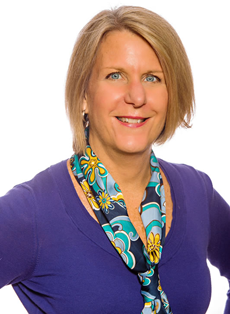 Dr. Earl earned her Bachelor of Arts degree from St. Olaf College and her Doctorate from the University of Minnesota. 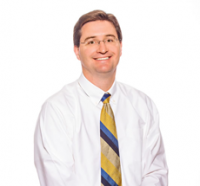 Dr. Earl has taken particular interest in laser surgery and performs surgery at the state fair every year. She currently owns two cats named ‘Dublin” and “Paisley” and enjoys outdoor activities, gardening and home decorating in her spare time. 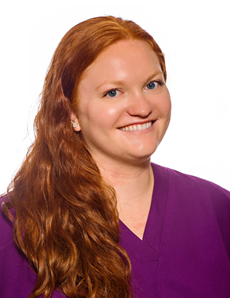 Dr. Josephs is a graduate of Augustana College in Sioux Falls, SD and received her DVM degree from the University Of Minnesota College Of Veterinary Medicine. Prior to joining the staff at Oak Knoll, she practiced in Richfield, MN for 13 years. When she is not working, she loves to spend time with her husband, son and daughter, read, and exercise. She shares her home with three cats: “Miso”, “Shrimpton” and "Gingersnap". Becky enjoys working at Oak Knoll because we have an enthusiastic and hard-working team and great clients and pets. 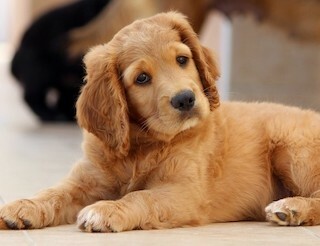 I enjoy being able to help pet owners take the best possible care of their furry family members. 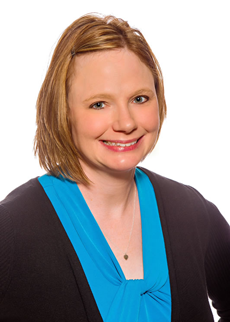 Dr. Samantha Gardner went to undergrad at North Dakota State University studying zoology and biochemistry. She then received her DVM degree from the University of Minnesota. Dr. Gardner is excited to meet new clients and getting to know the pets here at Oak Knoll! In her free time, she enjoys being outdoors hiking, fishing, playing volleyball and softball, and watching Minnesota sports teams. She has a cat named “Marlin” and two black labs, “Bo” and “Aero”. 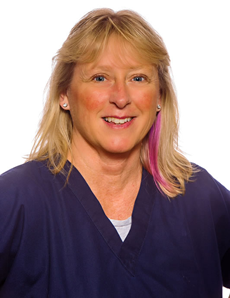 Kari has been a part of the Oak Knoll Animal Hospital team since 2007. She has a strong background in customer service and office management. She is a graduate of the University of Minnesota – Crookston with a Bachelor’s degree in Business Marketing and Management. She enjoys working at Oak Knoll because each day brings different challenges and at the end of the day it can be so rewarding. She has 3 cats which are all rescues, “Silk”, “Clooney” and “Lily”. After 20+ years in Healthcare, Kendra decided to turn her love of animals into a career. 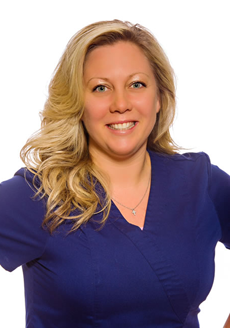 She has worked as a Certified Veterinary Technician at Oak Knoll Animal Hospital since graduating from the Medical Institute of Minnesota in 1999. One of her favorite things about working here is seeing the clients and their animals return year after year. She currently has two cats, “Izze” and “Louie” and one dog, "Hector". Robyn worked in restaurant management for eight years before embarking on a career helping animals. 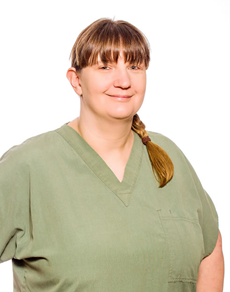 After graduating from the Medical Institute of Minnesota in 2001, Robyn began her internship right here at Oak Knoll Animal Hospital. The internship developed into a full time position and she has been working here ever since. In her spare time she enjoys watching movies, reading, shopping and playing with her cats. 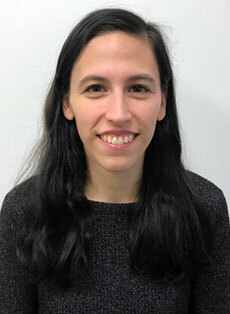 Robyn enjoys working at Oak Knoll for many reasons, including her love of animals and getting to work with them every day brings joy to her life, and also the work is very interesting and never boring. Robyn recently won a VHA competition about the reasons she loves being a vet tech. Read her winning article here! Amber is a 2006 graduate of Ridgewater College in Willmar. She worked in southern MN for a couple years before joining Oak Knoll Animal Hospital in January of 2009. She enjoys working at Oak Knoll because there is something new and exciting every day and enjoys the clients and their pets. 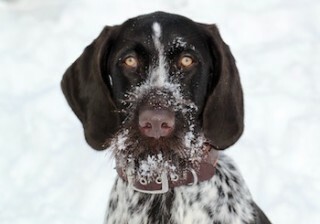 In her free time, she enjoys spending time with her dog “Milo”. 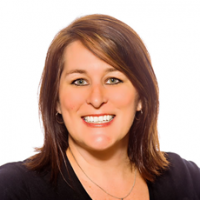 Heidi is a 2013 graduate of Argosy University in Eagan, MN and has been a member of our team since November 2012. She did her internship here before being hired on as a full time technician. While in school, she worked at another local clinic to gain experience and insight into the industry. 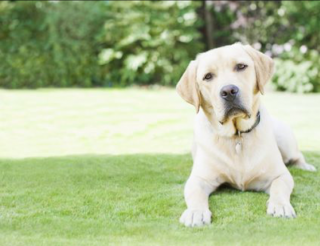 Heidi has three dogs, “Eva”, “Ralphie” and "Lily" and two cats “Peanut” and "Wall-E" who she enjoys spending time with. I like working at Oak Knoll because everyone is very caring and compassionate. I feel my career as a vet tech is very rewarding. At Oak Knoll, we are one big family so it makes working together a lot of fun. Nikki graduated from Minnesota School of Business in December 2007. She worked in Hopkins the last 10 years before joining Oak Knoll Animal Hospital in July 2017. She enjoys new challenges each day, patient care, nutrition and talking with clients. In her spare time she is either doing Crossfit, snowboarding, scuba diving or cooking yummy Vegan meals with her husband. She has two cats “Crush" and "Coral" and two dogs named "Fin" and "Riv". MacKenize graduated in September 2017 from Broadview University in LaCrosse, WI. She did her internship in WI and then came to work at Oak Knoll. We are excited to have her on board and allow her to utilize her knowledge she gained from school and her internship. 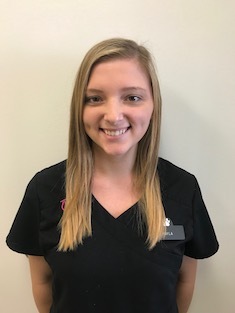 If MacKenzie is the technician that rooms you or helps you and your pet, make sure to say hello and introduce yourself. She is excited to meet all our patients and clients alike. Mackenzie has one cat "Kiki" and one dog "Baxter"
Kayla is the newest member of our Oak Knoll team. She graduated in May 2018 from Ridgewater College in Willmar, MN. She did her internship at an Emergency Clinic in Oakdale and started with us in October. We are excited to have her on board and allow her to learn and grow using the knowledge she gained through her education and the experience at the Emergency Clinic. If you see Kayla at your next visit, please introduce yourself and say hello! Kayla is looking forward to the fast-paced environment and all of the new experiences Oak Knoll has in store for her! Kayla has one dog "Nike"